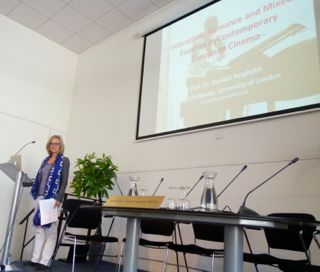 Daniela Berghahn gave a Keynote address entitled 'Interethnic Romance and Mixed Families in Contemporary European Cinema' at LovingDay.NL on 12 June 2015. LovingDay.NL, which has been inspired by the American annual celebrations Loving Day, is a public event celebrating mixed couples. 12 June is the anniversary of the 1967 Supreme Court decision in the case of Loving vs. Virginia. In this momentous ruling, the United States Supreme Court abolished all anti-miscegentation laws remaining in force in 16 U.S. states at the time. The Supreme Court ruled: "There can be no doubt that restricting the freedom to marry solely because of racial classifications violates the central meaning of the equal protection clause." LovingDay.NL was launched in 2013 with an annual symposium at De Balie, the most important cultural centre for public debate in Amsterdam. De Balie is leading in organising public debate activities with national impact. In 2015, the LovingDay.NL programme is co-curated by Betty de Heart (Professor of Migration Law) at Amsterdam University's Centre for European Law and Governance.